[CONFSERVER-45090] Firefox occasionally displays the 'connecting...' message, even though synchrony is connected via xhr fallback - Create and track feature requests for Atlassian products. 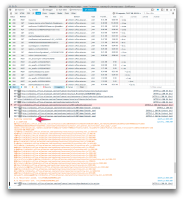 Occasionally, when xhr fallback is being used in firefox, the status message at the bottom does not become 'ready' but remain on 'connecting...', despite the editor working, and can view other collaborators' edits. I suspect it's caused by the backbone event being ordered differently on firefox - the disconnect event runs after the connected event, causing the display to be wrong.